Naturally, depending on the altitude profile of the Giro d’Italia, the Cima Coppi changes from year to year. The highest point of Cima Copi in history is Passo dello Stelvio (Stelvio Pass), which is 2758 meters. Passo dello Stelvio has been used in the 1972, 1975, 1980, 1994, 2005, 2012, 2014 and 2017 editions of Giro d’Italia. It was also expected in 1967, 1984, 1988 and 2013 editions, but in each case the course was modified due to weather conditions. Passo dello Stelvio was first included in the Giro d’Italia route in 1953 and Fausto Coppi was the first rider atop it. The first Cima Coppi prize, at the 20th stage of the 1965 Giro, won by the Italian rider Graziano Battistini of Vittadello team. The stage finish was planned to be atop Stelvio, but due to an avalanche, the road has been blocked and the riders had to dismount and run with their bikes to the finish line. The winner of 1965 Giro was the Italian rider Vittorio Adorni of Salvarani team. Before the Stelvio stage, Adorni was 11 minutes 26 seconds ahead of second-place Italo Zilioli, so he raced defensively. Battistini finished the 1965 Giro at 16th place, 32 min 50 sec behind Adorni. Passo Pordoi was included in the 20th stage. It was a 215 kilometers monster stage going over the Pordoi, Falzarego, Tre Croci, Cibiana and Duran passes. The first rider at the summit of Pordoi was Franco Bitossi, the Italian rider of Filotex team. The stage won by Felice Gimondi, the Italian rider of Salvarani team. Just 26 seconds behind Gimondi, Bitossi, Vittorio Adorni (Salvarani), Jacques Anquetil (Ford), Gianni Motta (Molteni), Italo Zilioli (Sanson), Franco Balmamion (Sanson) and Julio Jiménez (Ford) came together. 1966 Giro won by Gianni Motta. Bitossi finished in eighth place, 9 min 24 sec behind Motta. The Cima Coppi of 1967 Giro d’Italia, the 50th edition of the Italian grand tour, Tre Cime di Lavaredo, was included in the 19th stage. The difficult climb was at the end of the stage. The weather was dreadful, it was raining most of the day and at the Tre Cime, it started snowing. Wladimiro Panizza, the Italian rider of the Vitadello team was around 3 minutes aead of the peloton at the beginning of the climb. He was an extraordinary climber, and it looked like he was going to win the stage. But, with two kilometers to go, at the stiffest part of the climb where the gradient is almost fourteen percent (it hits at 18% at one point), the chasing riders, who were exhausted both morally and physically, started hanging on the team cars and being towed up to the summit. Felice Gimondi (Salvarani) was first across the line because, as sportswriter René de Latour (born New York, United States, 30 September 1906, died Quiberon, France, 4 September 1986. He was a Franco-American sports journalist, race director of the Tour de l’Avenir cycle race, and correspondent of the British magazine, Sporting Cyclist) noted, “he had the fastest car”. Outraged, a furious Vincenzo Torriani (race director) wouldn’t let the fraudulent result stand and annulled the stage. La Gazzetta writer Bruno Raschi called it “le montagne del disonore” (the mountains of dishonor). Gimondi won the 1967 Giro. Wladimiro Panizza finished in 22nd place at 53 min 3 sec. Eddy Merckx after winning stage 12 of the 1968 Giro d’Italia atop Tre Cime di Lavaredo. It was rated as one of the most impressive sporting feats in the history of the Giro d’Italia. Again the “Tre Cime”. This time, the legendary Eddy Merckx (Faema) won the stage, and the Giro. The main favorites of the 1968 edition were last year’s winner Felice Gimondi (Salvarani), two times runner-up Italo Zilioli (Filotex), Franco Balmamion (Molteni), and 1965 winner Vittorio Adorni (Faema). According to the Italian sports media, Merckx was “a sprinter from Belgium”. Tre Cime di Lavaredo was included in the 12th stage. The weather was bad that day. There was a breakaway which started with around ten minutes of advantage to the climb. But it would become one of the historical days in the history of the Giro d’Italia: under the bitter rain and snow, Merckx closed a ten-minute gap on a breakaway group to win the stage and seal the first Belgian victory in Giro d’Italia. He was wearing shorts, a short-sleeve jersey, thick gloves and a woolen cap – his photo at the finish was a summary of a dreadful – but glorious day on the bike. The second rider who crossed the finish line atop Tre Cime at 40 seconds to Merckx was Giancarlo Polidori (Pepsi Cola), the only survivor of the original breakaway. At 54 seconds, Adorni finished in third. 22-year-old Eddy Merckx won the 1968 Giro d’Italia. It was his first grand tour victory. 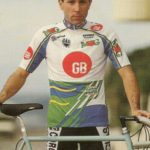 Later in his career, he won four more Giri, five Tours, and a Vuelta. 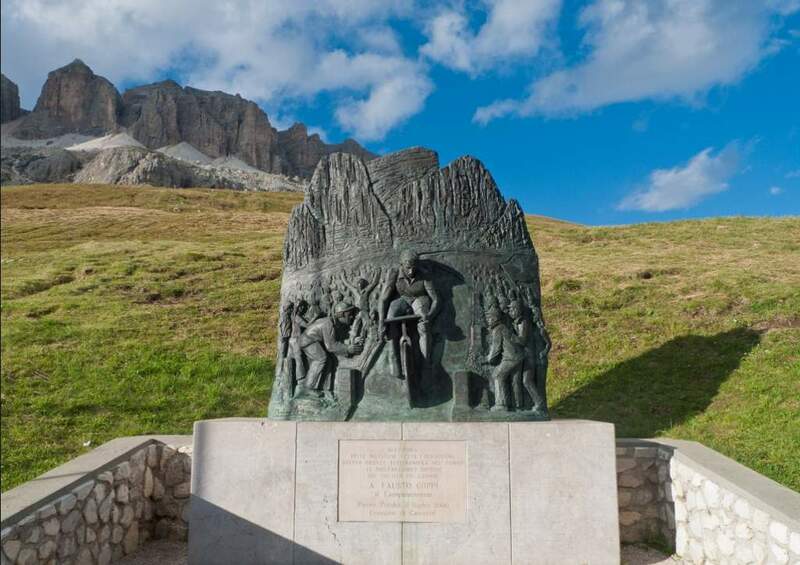 The Cima Coppi of the 1969 edition was Passo Sella, which was included in the 21st stage, a 131-kilometer short but tough course between Rocco Pietore and Cavalese. The major ascents were Campolongo, Gardena, Sella, Costalunga, and Lavazze. Claudio Michelotto, the Italian rider of Max Meyer Paints team was the first over the final three passes, including Cima Coppi. He won the stage in 4 hr 0 min 22 sec, 1:55 ahead of the eventual winner Felice Gimondi (Salvarani). Michelotto finished this Giro in second, 3 min 35 sec behind Gimondi, his highest placing ever. He also won the mountains classification. 20th and the final stage of the 1970 Giro – it was a 155 km stage from Dobbiaco to Bolzano which feature Campolongo, Pordoi, and Sella passes. Luciano Armani, the Italian rider of the SCIC team was the first atop Passo Pordoi. Armani won the stage 2 min 52 sec ahead of the big names including Michele Dancelli (Molteni), Franco Bitossi (Filotex), Giancarlo Polidori (SCIC) and the eventual winner Eddy Merckx (Molteni). He finished this Giro in the 33th place, 1 hr 10 min 13 sec behind Merckx. The Cima Coppi of the 1971 edition, Grossglockner was featured in the 17th stage. The major ascents were Galberg Sattel, Felbertauern tunnel, twice up Grossglockner in the 106 km stage between Tarviso and Grossglockner. Stage winner Pierfranco Vianelli (Dreher) was the first atop Grossglockner in the both two ascents. This edition was won by the Swede Gösta Pettersson (Ferretti). Vianelli finished in fifth, 6 min 41 sec back. Again the Stelvio, this time full ascent. The monster climb was included in the 17th stage, a 88 km route from Livigno to the top of Passo dello Stelvio. The ascent to Stelvio was from the north (Trafoi side). 20 km from the finish, KAS team’s Spanish rider, José Manuel Fuente, nicknamed “El Tarangu” (which is a word in the Asturian language for a man reputed for his strength and character), attacked. Fuente was using an unbelievable 54 x 18 gear ratio that day – it has been said that only Fausto Coppi had been able to use such a huge gear on the Stelvio. He crossed the finish line at the top of the Stelvio 32 seconds ahead of his teammate Francisco Galdós and 2 minutes 5 seconds ahead of the eventual winner Eddy Merckx. Merckx retained in pink that day. Fuente finished in second in the overall classification, 5 min 30 sec behind Merckx. He also won the mountains classification. José Manuel Fuente of KAS team won the prize again. It was at stage 19, a 208 km monster stage from Andalo to Aurozo di Cadore, which include Valles, Santa Lucia, Giau, Tre Croci passes. Merckx was so dominant during the 1973 race. Before that penultimate stage, Fuente attacked on many stages with no avail, every time Merckx caught and passed him. But this time, his efforts paid back. He took off at the first ascent, Passo Valles, and was never seen again. He won the stage 1 min 6 sec ahead of Francesco Moser (Filotex). At 1 min 8 sec, Ole Ritter came. The big favorites’ group which include the eventual winner Eddy Merckx (Molteni), Felice Gimondi (Bianchi), Enrico Paolini (SCIC), Wladimiro Panizza (G.B.C. ), José Pesarrodona (KAS), Gianni Motta (Zonca) and Italo Zilioli (Dreherforte) came home 2 min 38 sec after Fuente. Eddy Merckx won the 1973 giro 7 min 42 sec ahead of Gimondi. Fuente finished in 8th place, at 26 min 6 sec. 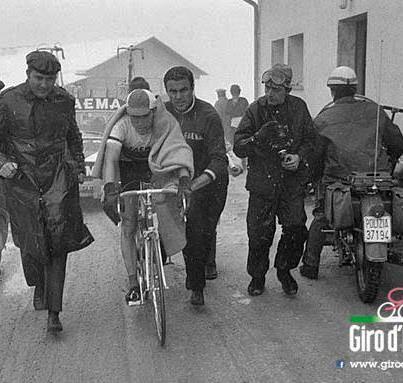 The movie named “Stars and Water Carriers” (directed by Jørgen Leth) tells the story of the 1973 Giro d’Italia. “El Tarangu” again, for a third consecutive time, a feat that no other rider has been able to accomplish to date. Only José Jaime González, the Colombian rider was able to win the prize three times, but he didn’t make it three-in-a-row. 1974 Cima Coppi, the Tre Cime was featured in the 20th stage, a 163 km course from Pordenone to Tre Cime di Lavaredo. Fuente was wearing the maglia rosa until the 14th stage. But at that stage, which was relatively flat, he lost the jersey to Eddy Merckx (Molteni). In the middle of the stage, Giambattista Baronchelli (SCIC) atacked on the Merckx/Fuente group. Shoertly after, Merckx and Felice Gimondi (Bianchi) also took off. Somehow, Fuente missed the decisive move. It was like Contador’s 2012 Vuelta attack on Rodriguez. Fuente lost 10 minutes 19 seconds, with the chance of winning the Giro. After the stage, Fuente said that he forgot to eat, a surprisingly common mistake inside the pro peloton. But he kept attacking. He won stage 16. At the 20th stage, ten kilometers from the top of tre Cime, Fuente attacked and won the stage. Eddy Merckx was the overall winner just 12 seconds ahead of Baronchelli (it wasn’t the smallest winning margin, in 1948, Fiorenzo Magni won with 11 seconds over Ezio Cecchi). Fuente was fifth, 3 min 22 sec behind Merckx. The documentary movie named “The Greatest Show on Earth” (by Michael Pfleghar and Hans Gottschalk) tells the story of the 1974 Giro d’Italia. 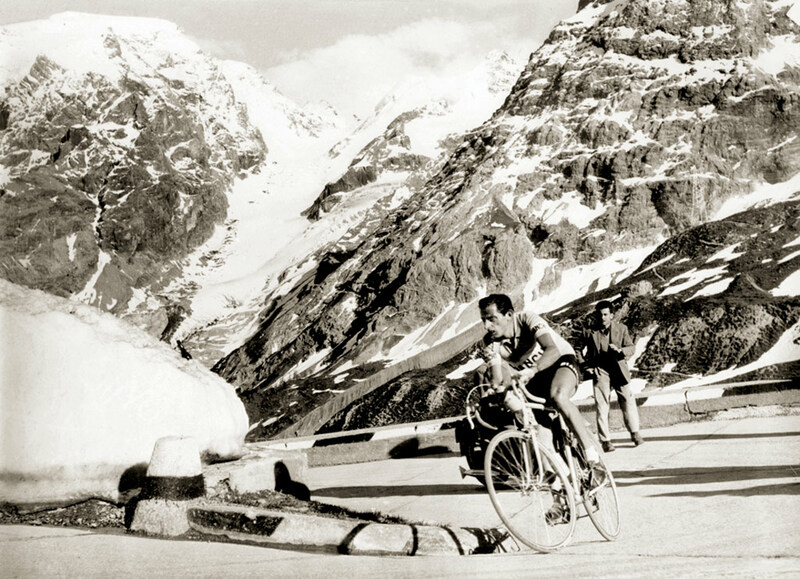 Francisco Galdós climbing Passo dello Stelvio with Fausto Bertoglio on his wheel, 1975. Eddy Merckx got sick at the Tour de Romandie and at the last minute he and his entire team withdrew from the Giro. This edition ended at the top of the Passo Stelvio. The last stage also went overthe San Pellegrino and the Costalunga passes. At the start of the last stage, the Spaniard Francisco Galdós (KAS) was only 41 seconds behind the GC leader Fausto Bertoglio (Jolly Ceramica). Before Stelvio, there were no action ton either the San Pellegrino or the Passo di Costalunga, everyone was waiting for the grand finale. While climbing the Stelvio, Galdós attacked many times, but every time Bertoglio was able to match him. He needed only to stay on Galdós’ wheel. Near the summit, Bertoglio attacked once, this time Galdós chased him down and catch him. The duo crossed the line together – Galdós as the stage and Cima Coppi prize winner, Bertoglio as the overall winner. Andrés Gandarias, the Spanish rider of Teka team was the first atop Torri del Vajoletin the 19th stage. It was a 132 km from Longarone to the top of Torri del Vajolet. There ere six categorized climbs in such a short stage: Staulanza, Santa Lucia, Falzarego, Gardena, Sella and Vajolet. Gandarias was no threat for the general classification, and he won the stage with a solo attack. Felice Gimondi (Bianchi) won the 1976 edition, and Gandarias was 52nd at 1 hr 34 min 31 sec. It was also Eddy Merckx’ last Giro, where he finished 8th, at 7 min 40 sec. The 1977 Giro d’Italia was the 60th edition of the race. Stage 18, a 223 km course from Cortina d’Ampezzo to Pinzolo had five major ascents: Valparola, Gardena, Sella, Costalunga, Mendola, Campo Carlo Magno. Faustino Fernández Ovies, the Spanish rider of KAS team was first atop Valparola, but Gaetano Baronchelli (SCIC) won the stage. 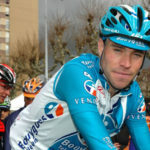 Michel Pollentier, the Belgian rider of Flandria team won the 60th edition. At 49 min 54 sec Ovies was 31st. There was four mountain passes included in 220 km stage 15 between Treviso and Canazei: Consiglio, Rolle, Valles and San Pellegrino. It was a snowy day in the Dolomites. Gianbattista Baronchelli, the Italian rider of SCIC team attacked on Valles with Francesco Moser (Sanson) and the eventual GC winner Johan de Muynck (Bianchi) on his wheel. Then Alfio Vandi (Magniflex) caught the leading group. Baronchelli was the first atop Passo Valles. Over the final climb, the San Pellegrino, Moser cracked and lost over a minute to the lead trio of Baronchelli, Vandi and de Muynck. Baronchelli won the stage and moved up to second in the Overall where finished the Giro. After the stage, the judges also gave Moser a few seconds of penalty, because the tifosi had pushed him up the hills. At the stage 17, a 194-kilometer trip from Pieve di Cadore to Trento, there were two major climbs, the Falzarego and Pordoi, but they were many kilometers before the finish. Leonardo Natale, the Italian rider of Sapa team was the first atop Pordoi. Francesco Moser (Sanson) won the stage. The eventual winner of this Giro was Giuseppe Saronni (SCIC), and Natale finished in 16th place, 25 min 1 sec behind him. The Stelvio was featured in the 20th stage. Before the stage, Bernard Hinault (Renault-Gitane) was in second place in GC, 1 min 8 sec behind Wladimiro Panizza (Gis Gelati). The Italian riders were combined their forces against him. But at that stage, a 221 km trip between Cles and Sondrio, the Renault-Gitane team managed to put 3 of his gregari, including Jean-René Bernaudeau into the breakaway. On the Stelvio, Bernaudeau was able to ride away from the others in the breakaway group. Then, Hinault attacked and caught Bernaudeau. Hinault’s gregario was first atop Stelvio. After stelvio, the Renault-Gitane pair had to ride about 80 kilometers further to Sondrio. They managed to extend their lead over Panizza. Hinault let Bernaudeau take the stage while Hinault took the lead. Hinault won the 1980 Giro d’Italia and became the second Frenchman to win the Italian grand tour, after Jacques Anquetil. Bernaudeau finished in 12th place, 28 min 18 sec behind him. Stage 20 featured two major ascents: Tre Croci and Tre Cime di Lavaredo. Swiss climber Beat Breu of Cilo-Aufina team was first both atop the Tre Croci and to the top of Tre Cime di Lavaredo. The GC was very close and after stage 19, the top four riders were only 30 seconds apart. Silvano Contini (Bianchi) was leading the GC, and Battaglin was second at 3 seconds. But, on the stage 30, Giovanni Battaglin rode really good on Tre Cime and became the new leader. He cemented his victory in the final stage with an excellent time trial in Verona. Breu finished in eight overall, 10 min 2 sec behind Battaglin. The penultimate stage (21) was a monster: it was a 254 km long going from Cuneo to Pinerolo, featuring five major ascents: Maddelena, Vars, Izoard, Montgenèvre and Sestriere. This was the same route used in stage seventeen of the historic 1949 Giro where Fausto Coppi had displayed extraordinary superiority, beating Gino Bartali by 12 minutes. Lucien Van Impe, the Belgian rider of Metauro Mobili team was first atop Izoard. Giuseppe Saronni (Del Tongo) won the stage. Van Impe finished this Giro in fourth place, 4 min 31 sec behind the eventual winner Bernard Hinault. The monster 20th stage of the 1983 Giro d’Italia, a 169 km going from Selva di Val Gardena to Arabba, featured four (five) major ascents: Campolongo, Pordoi, Sella, Gardena and again Campolongo. The first rider to cross the Pordoi Pass was the Spanish rider Marino Lejarreta (Alfa Lum). Alessandro Paganessi (Bianchi) won the stage. The overall winner was Giuseppe Saronni (Del Tongo). Lejarreta finished in sixth place, 7 min 47 sec behind the winner. The very same stage with the previous year, again 20th leg. Laurent Fignon, the French star of Renault-Elf escaped on the Pordoi and never seen again. He arrived into Arabba 2 minutes 19 seconds ahead of Francesco Moser (Gis Gelati) and took the GC lead. But, in the final time trial, a 42 kilometer route from Soave to Verona, Moser rode a road version of his aerodynamic World Hour Record bike and won the stage in 49 minutes 26 seconds. Fignon came in second, 2 minutes 24 seconds slower. Moser’s average speed of 50.977 kilometers an hour is the fastest-ever time trial longer than 20 kilometers – a record still stands. Fignon finished second in GC, 1 min 3 sec behind Moser. Also, it was later alleged that the TV helicopter had flown directly in front of Fignon during the time-trial creating a headwind, but behind Moser, creating a tailwind. But, one must always take a cyclist’s claims with a pinch of salt. 19th stage was a 247 km going from Domodossola to St. Vincent featuring two major ascents (Sempione and Gran San Bernardo). But, before the stage, riders surprisingly learned out that the race director, Vincenzo Torriani had removed the last six kilometers (the steepest part) of the Gran San Bernardo pass from the day’s route. Stage nineteen had the Simplon and Gran San Bernardo Passes, and at the unveiling of the route, the entire Gran San Bernardo Pass was to be climbed. When the day’s route maps were passed out, it turned out that Torriani had removed the steep final section of the top of the Gran San Bernardo from the day’s schedule, stopping at the entrance to the tunnel, six kilometers from the summit. Bernard Hinault (La Vie Claire) was leading the GC 1:30 ahead of Francesco Moser (Gis Gelati). The new “shortened” course with the steepest part removed obviously favored Moser, so Hinault wasn’t happy with that weird decision. Reynel Montoya, the Colombian climber of Varta-Cafe de Colombia team was first atop Sempione. At the end of the stage, a big pack containing 53 riders including the favorites came to the line together and Moser (as predicted) was the winner. He took the 20 seconds of time bonuses. 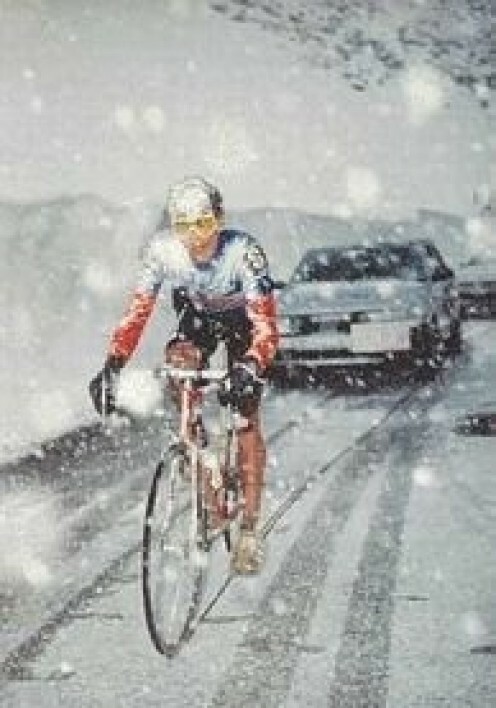 Despite this, Hinault won the 1985 Giro. Reynel Montoya finished in 45th, 1 hr 3 min 5 sec to Hinault. Stage 21, the penultimate stage of the 1986 Giro was a 234 km going from Bassano del Grappa to Bolzano featured four major climbs (Rolle, Pordoi, Campolongo and Gardena). Spanish climber Pedro Muñoz (Fagor) was fist atop Pordoi. Acácio Da Silva (Malvor-Bottecchia) won the stage. Roberto Visentini (Carrera) won the GC, Muñoz finished in 10th, 11 min 52 sec behind the winner. There were five major ascents at the stage 16, a 214 km going from Sappada to Canazei: Croce Comelico, Gardena, Sella, Pordoi and Marmolada. French rider Jean-Claude Bagot (Fagor) was first atop Pordoi. Johan Van der Velde (Gis Gelati-Jolly Scarpe) won the stage. The Irishman Stephen Roche (Carrera) won the 1987 Giro. Jean-Claude Bagot finished in 25th, at 36 min 30 sec. The fifteenth stage of the Giro d’Italia was originally scheduled to start in Bormio and go up the south face of the Passo dello Stelvio with the finish at the Merano 2000 ski station. But, it was snowing atop the Stelvio, so the race director, Vincenzo Torriani had the race start over the hill in Spondigna, just beyond the Stelvio descent. The Passo dello Stelvio was not climbed due to snow drifts that had developed on the roads. 1988 Giro was won by Andy Hampsten (7 Eleven) in a sansational style. He became the first (and to date, the only) American rider to won the Italian grand tour. The sixteenth stage containing the Gavia pass was cancelled as a whole due to poor weather and snow accumulation on the roads. Laurent Fignon (Super U) won the 1989 Giro d’Italia. Stage 16 featured six major ascents: Valparola, Gardena, Sella, Pordoi, Marmolada and again Pordoi. The Italian rider Maurizio Vandelli (Gis Gelati-Benotto) was the first atop Pordoi at the 1st pass. 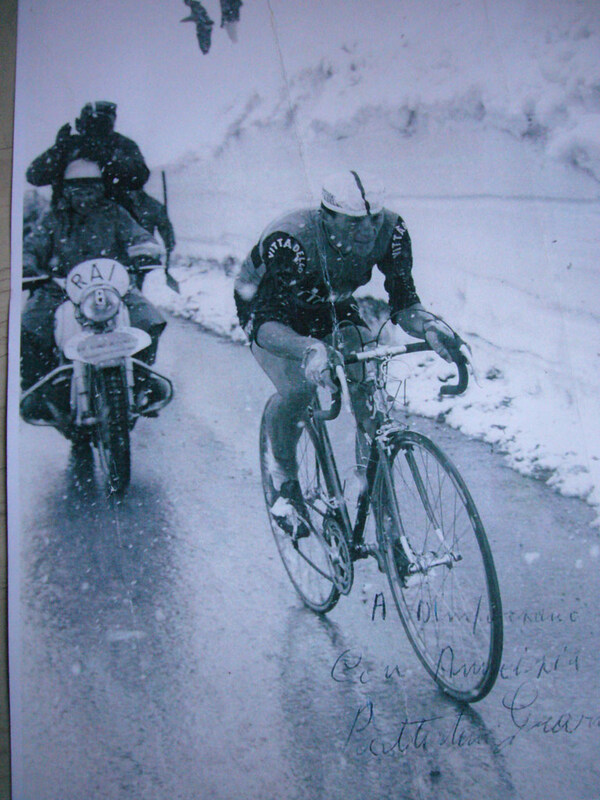 Then, on Marmolada, Charly Mottet, the French rider of the RMO team attacked. He took the eventual GC winner Gianni Bugno (Chateau d’Ax-Salotti) with him. Bugno was untouchable at this Giro. The duo worked together at the second ascent of Pordoi and Bugno gifted the stage to the Frenchman. Mottet finished this giro in second, 6 min 33 sec behind Bugno. Vandelli finished in 22nd, 40 min 48 sec down. In 1965, 1967, 1968, 1969, 1970, 1971, 1972, 1973, 1974, 1975, 1976, 1978, 1980, 1981, 1984, 1987, 1990, 1991, 2002, 2010, 2012, 2013 who passed the Cima Coppi first was also the stage winner (in another way, in 1966, 1977, 1982, 1983, 1985, 1986, 1992, 1993, 1994, 1996, 1997, 1998, 1999, 2000, 2003, 2004, 2005, 2006, 2007, 2008, 2009, 2011, 2015, 2016,2017 who passed the Cima Coppi first was not the stage winner). In 1993 and 1998, who passed the Cima Coppi first was also the overall winner (1993 Miguel Indurain of Spain, stage won by Claudio Chiappucci of Italy, 1998 Marco Pantani of Italy, stage won by Giuseppe Guerini of Italy). In 1967, 1968, 1991 and 2013, who passed the Cima Coppi first was also both the stage and overall winner (1967 Felice Gimondi of Italy, 1968 Eddy Merckx of Belgium, 1991 Franco Chioccioli of Italy, 2013 Vincenzo Nibali of Italy). Offset 800 m from the brow, due to avalanche. Stage canceled due to bad weather. Stage cancelled due to protests. The Passo dello Stelvio was planned as Cima Coppi, but the stage has been canceled due to bad weather.